Seminar “Entry Strategy and Practice for Indian Market” was held on November 27, 2017 at My Dome Osaka in Osaka and on November 29 at Embassy of India in Tokyo. Each of seminar was sponsored by Federation of Indian Chambers of Commerce and Industry(FICCI)/Osaka Chamber of Commerce and Industry for Osaka, and Federation of Indian Chambers of Commerce and Industry(FICCI)/M + V Japan which is run by our company for Tokyo. We also had a support from Consulate General of India, Osaka-Kobe and JETRO Osaka, and The Japan-India Business Co-operation Committee and Embassy of India. Approximately 100 people participated on both seminar. We would like to thank everyone who participated for this occasion. Thank you very much. At this seminar, not only about the attractiveness and possibilities of the Indian market and options for entry strategies, but also soutions related to human resources, organization and actual entry examples were explained in detail. In Osaka, it was started by the greetings from Mr. Shri T. Armstrong Changsan who is a Consul General of India and in Tokyo, we had a speech about Economic policy and future prospects of Indian government by H.E. Mr. Sujan R. Chinoy Ambassador. After that, we had a presentation about “Indian Market Environment -Importance for Japanese companies-” as part1 by Mr. Atul Shunglu from FICCI and for part2 and 3, Mr. Klaus Maier and Ms. Samriti Parashar from M+V gave a presentation about problems for entry strategy for Indian market and business culture in India” and human resources/organization. 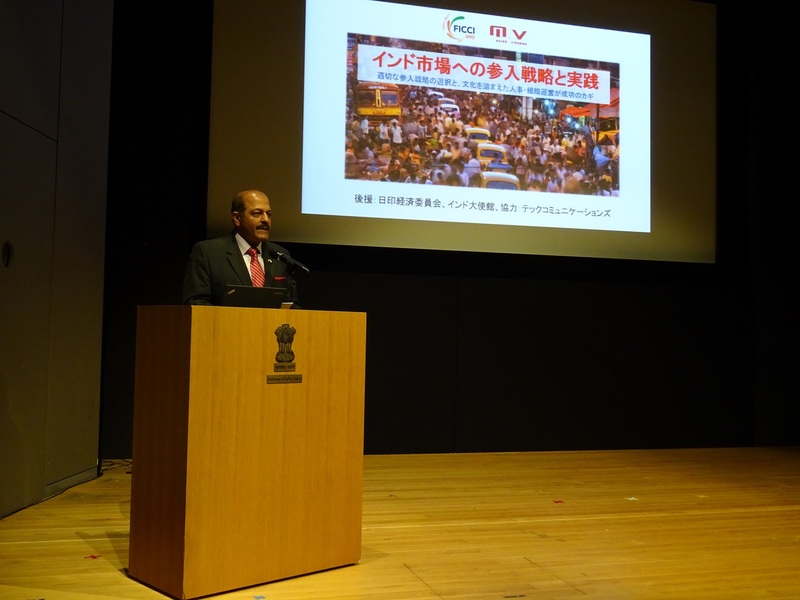 M + V Japan is planning to hold seminars on the actual situation of Indian business in the future. Thank you for your continued support for M + V Japan.